This is a huge holiday season! We have new titles from many huge publishers, and one specifically that is receiving a lot of hate. I can’t figure out why that is. Trust me, I’ve looked. 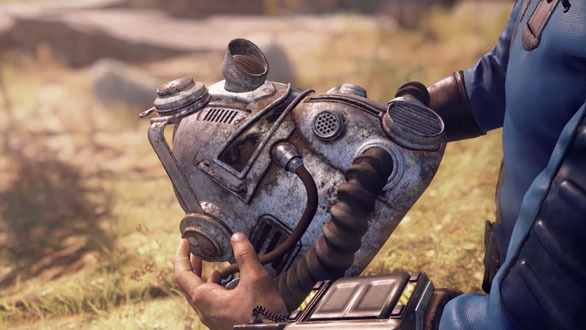 Fallout 76 has people complaining that it’s a multiplayer game. Last night I wandered through post-apocalyptic West Virginia with one of my best friends. We ventured, barely interacted with anyone else, and explored a lot of fun stuff. Today while having my morning coffee I hopped on and wandered through the Morgantown where we’d been doing the main storyline the night before. Instead of going to the schools where the main quest took us, I wandered through the town. Collecting notes and piecing together what happened in this particular spot is what makes Fallout 76 shine. You get to find out what’s going on by investigating. Which makes sense. Storyline wise the dwellers of Vault 76 are the only main survivors and you’ve just left the vault. The theme of the intro to the game is literally Reclaimation Day. The trailer encourages players to go out and rebuilt. It’s literally the point of the game to explore the vast world and see what’s out there. Somehow that isn’t translating into interest for many other gamers and I don’t know why. Are there bugs? Sure! But literally every other Bethesda game has issues like this. None of them have been game breaking for me. I don’t get it. I spawn at my camp and I’m too far in the ground. I jump a couple times and I’m on solid ground. Oh no, my inventory stash from my camp isn’t active to use for crafting in my camp. So I walk to it, look at my stash and it loads. Problem solved. Maybe it’s beta footage that people are watching that had much more serious problems, but I’m just not having issues. I could be playing anything and instead I’m loading up Fallout 76. The odd time I’ll hop on Starlink because it’s quick to pick up and play the digital version. This is my current holiday. When I want to enjoy some time together gaming with my wife, I put on Pokémon Let’s Go. It’s weird that so many people are on the hate train for this game. I don’t understand how I’m having so much fun and no one else is. I’m a picky gamer! I mean, I didn’t say Fallout 76 was my blind choice for what I’m playing now. Out of any game I could be playing, this one is my pick. To be honest I’m enjoying it more than Fallout 4! Why? Because when I stepped out of the vault in Fallout 4 I laughed and said, “Hey, wouldn’t it be funny if the ending was this.” I nailed it. Hours upon hours later I’d figured out the ending of Fallout 4 within the first fifteen minutes. So why would I want a convuluted and branching story? I want to explore and take in this huge gaming world! Constantly saying, “What the hell is that? ?” in honest interest is what keeps me going. Even the storage, which I hate the limit on, is making me play Fallout in new ways. I’m now having to decide what to hold on to and what to let go of. So if you’ve only seen beta footage and you enjoy Fallout games for the exploration, don’t give up on this one. It’s not a train wreck at all and honestly if I could place junk items around my camp, I’d probably be giving this game a perfect score. Does it have bugs? Sure! But is it enjoyable regardless? It is to me. I have no reason to lie to you. I paid for this game! Full price. In no way has Darkain Arts Gamers received a code or any endorsement to promote this game. I’m eager to play with more of my friends that are getting the game soon. Leveling up, doing events, and branching out into the world is great! It’s like Destiny with a much much larger world to explore and junk items that I want to be able to do more with.